This article is about the section of highway in Michigan. For the entire length of highway, see Interstate 94. Interstate 94 (I-94) is a part of the Interstate Highway System that runs from Billings, Montana, to the Lower Peninsula of the US state of Michigan. In Michigan, it is a state trunkline highway that enters the state south of New Buffalo and runs eastward through several metropolitan areas in the southern section of the state. The highway serves Benton Harbor–St. Joseph near Lake Michigan before turning inland toward Kalamazoo and Battle Creek on the west side of the peninsula. Heading farther east, I-94 passes through rural areas in the middle of the southern Lower Peninsula, crossing I-69 in the process. I-94 then runs through Jackson, Ann Arbor, and portions of Metro Detroit, connecting Michigan's largest city to its main airport. Past the east side of Detroit, the Interstate angles northeasterly through farmlands in The Thumb to Port Huron, where the designation terminates on the Blue Water Bridge at the Canadian border. The first segment of what later became I-94 within the state, the Willow Run Expressway, was built near Ypsilanti and Belleville in 1941, with an easterly extension to Detroit in 1945. This expressway was initially numbered M-112. In the mid-1950s, state and federal officials planned an Interstate to replace the original route of U.S. Highway 12 (US 12). By 1960, the length of I-94 was completed from Detroit to New Buffalo. Two years later, the US 12 designation was dropped from the freeway. Subsequent extensions in the 1960s completed most of the rest of the route, including the remaining sections between Detroit and Port Huron which superseded the routing of US 25. The last segment opened to the public in 1972 when Indiana completed its connection across the state line. Since completion, I-94 has remained relatively unchanged; a few interchanges have been rebuilt, a second span was constructed for the Blue Water Bridge, and in 1987, a plane crashed on the freeway during take off from the airport in Detroit. The routing of I-94 is notable for containing the first full freeway-to-freeway interchange in the United States, connecting to the Lodge Freeway (M-10), and for comprising the first complete border-to-border toll-free freeway in a state in the United States. The highway has one auxiliary route, I-194, which serves downtown Battle Creek, and eight business routes. Various segments have been dedicated to multiple people and places. The entire length of I-94 is listed on the National Highway System, a network of roadways important to the country's economy, defense, and mobility. The freeway carried 168,200 vehicles on average between I-75 and Chene Street in Detroit, which is the peak traffic count in 2015, and it carried 12,554 vehicles immediately west of the Blue Water Bridge in Port Huron, the lowest traffic count in 2015. As the state trunkline highway closest to the lake shore in these areas, I-94 carries the Lake Michigan Circle Tour south of Benton Harbor–St. Joseph and the Lake Huron Circle Tour in the Port Huron area. Sections through the Detroit area are named the Detroit Industrial and Edsel Ford freeways. I-94 in the state is either a four- or six-lane freeway for most of its length; one segment in the Detroit area has up to ten lanes total near the airport. I-94 enters Michigan from Indiana south of New Buffalo. The freeway runs northeasterly through rural Michiana farmland in the southwestern corner of the Lower Peninsula and parallels the Lake Michigan shoreline about three miles (4.8 km) inland. I-94 traverses an area just east of the Warren Dunes State Park as the freeway runs parallel to the Red Arrow Highway, a former routing of US Highway 12 (US 12) named after the 32nd Infantry Division (Red Arrow Division). The freeway crosses its companion highway south of St. Joseph; Red Arrow turns northward carrying the business loop for Benton Harbor and St. Joseph (Business Loop I-94, BL I-94). The Interstate curves further inland to bridge the St. Joseph River near Riverview Park. East of Benton Harbor, I-94 meets the Napier Avenue interchange, where US 31 merges onto the freeway. East of the Southwest Michigan Regional Airport, I-94/US 31 meets the southern end of I-196; US 31 departs the I-94 freeway to follow I-196, and I-94 continues its course away from Lake Michigan. South of Coloma, the trunkline turns eastward and roughly follows the Paw Paw River on a course that takes it south of Watervliet and Hartford. Between the latter two cities, the freeway transitions from northeastern Berrien County into western Van Buren County. It curves around and between Lake Cora and Threemile Lake near the junction with the northern end of M-51. About four miles (6.4 km) further east, I-94 crosses M-40 south of Paw Paw. Continuing eastward, the Interstate runs south of Mattawan before entering western Kalamazoo County. In Texas Township, the freeway enters the western edges of the Kalamazoo suburbs. South of the campus for Western Michigan University's College of Engineering & Applied Sciences in Portage, I-94 intersects US 131. That other freeway also carries Kalamazoo's business loop northward. Near the Kalamazoo/Battle Creek International Airport, the Interstate passes into the southeastern corner of Kalamazoo before entering Comstock Township. The freeway intersects the eastern end of the business loop at a partial interchange near Morrow Lake in the township. I-94 continues out of the eastern Kalamazoo suburbs, paralleling the Kalamazoo River through the Galesburg area. Before crossing into Calhoun County on the west side of Battle Creek, I-94 has the only driveway on any of Michigan's Interstate Highways for a gate providing access for military vehicles into the Fort Custer Training Center. The Interstate enters Calhoun County southwest of the W. K. Kellogg Airport and enters the city of Battle Creek. Immediately east of the county line, the freeway has an interchange with the western end of Battle Creek's business loop. Next to the Lakeview Square Mall, I-94 meets its only auxiliary Interstate in Michigan: I-194. I-94 turns to the northwest to round Beadle Lake, intersecting M-294 before spanning the Kalamazoo River. East of the river crossing, the freeway meets an interchange for M-96, M-311 and the eastern end of the Battle Creek business loop near the FireKeepers Casino Hotel in Emmett Township. Turning back eastward, The Interstate exits the eastern Battle Creek suburbs and continues to an interchange with I-69 near Marshall; the business loop for Marshall follows I-69 southward. Continuing eastward, I-94 traverses rural land on the north side of Marshall. The freeway runs north of, and parallel to, the Kalamazoo River through eastern Calhoun County. It angles southeasterly toward Albion before returning to an easterly course on the north side of town. I-94 crosses into western Jackson County before intersecting M-99. From there, it runs generally due east with a jog around Parma. West of the county airport, the Jackson business loop follows M-60 southward, and I-94 travels through the north side of Jackson. North of downtown, US 127 merges in from the north and runs concurrently with I-94 around the city. Southeast of the Michigan State Prison, US 127 departs to the south, and I-94 continues eastward through the rest of the county. The freeway runs north of the Chrysler Chelsea Proving Grounds in Chelsea next to the M-52 interchange. As I-94 continues easterly, it passes into the western edge of the Ann Arbor area. West of downtown, the M-14 freeway splits off to the northeast, and the Interstate turns to the south and southeast to curve around the south side of the city. The freeway passes between the Briarwood Mall and the Ann Arbor Municipal Airport. On the southeastern corner of Ann Arbor, I-94 intersects US 23 and continues around the south side of Ypsilanti. South of that city, the freeway also carries US 12 and crosses the Huron River north of the river's mouth at Ford Lake. I-94 jogs southeasterly around the south side of the Willow Run Airport complex, separating from US 12 and entering Wayne County. South of Willow Run, the Interstate parallels the north shore of Belleville Lake. East of the water body, it intersects I-275 near the northwest corner of Detroit Metropolitan Wayne County Airport and angles northeasterly through the southwestern Detroit suburbs along the Detroit Industrial Freeway. I-94 uses the Gateway Bridge over the single-point interchange at US 24 (Telegraph Road) in Taylor; these bridges were inspired by Super Bowl XL and provide a western entrance to the city. Further east, the Interstate intersects M-39 (Southfield Freeway) and passes the Uniroyal Giant Tire in Allen Park. I-94 then turns to the northeast through the Ford River Rouge Complex in Dearborn before turning back easterly on the Edsel Ford Freeway into Detroit. I-94 traverses Detroit in an east–west direction well inland of, and parallel to, the Detroit River. The freeway intersects I-96 (Jeffries Freeway) and M-10 (Lodge Freeway) on the West Side, passing the main campus of Wayne State University before entering the East Side at M-1 (Woodward Avenue). Immediately east of the interchange with I-75 (Chrysler Freeway), I-94 forms the southern border of the Milwaukee Junction district. The Edsel Ford Freeway continues through residential neighborhoods of Detroit's East Side. The Interstate turns more northerly, mimicking the shoreline of Lake St. Clair, and exits Detroit for Harper Woods. Just north of the interchange for M-102 (Vernier Road), the freeway crosses 8 Mile Road and enters Macomb County. Running northward through Macomb County, I-94 meets the eastern end of I-696 (Reuther Freeway) about three miles (4.8 km) north of the county line in St. Clair Shores. The freeway continues to parallel the lakeshore, and travels to the west of Selfridge Air National Guard Base in Harrison Township. It turns back to the northeast at 23 Mile Road at the interchange with M-3 and M-29. North of 26 Mile Road, the freeway exits the northern suburbs and passes into farmland in The Thumb region. South of Michigan Meadows Golf Course, I-94 crosses County Line Road and enters St. Clair County. The freeway continues northeasterly as far as Marysville before turning northward near the St. Clair County International Airport. From there, it runs roughly parallel to the St. Clair River. The Interstate travels along the western edge of residential areas for Marysville and Port Huron as it continues northward. Immediately west of downtown Port Huron, it intersects I-69; the two freeways merge and turn first east and then north through an interchange that also features connections to BL I-69. I-94/I-69 turns back to the east about a mile (1.6 km) north of their confluence to span the Black River north of downtown. On the eastern bank of the river, there is one final interchange for M-25 and BL I-69/BL I-94 before the freeway reaches the toll and customs plazas for the twin-span Blue Water Bridge. Past these plazas, I-94/I-69 ascends the approach to the bridge which crosses the St. Clair River to Point Edward (Sarnia), Ontario. At the international boundary at the center of the river, the Interstate designations jointly terminate, becoming Ontario Highway 402. The first major overland transportation corridors in the future state of Michigan were the Indian foot trails. One of these, the St. Joseph Trail, followed the general route of the modern I-94 across the state from the Benton Harbor–St. Joseph area east to the Ann Arbor area. The State Trunkline Highway System was created on May 13, 1913, by an act of the Michigan Legislature; at the time, Division 6 corresponded to the rough path of today's I-94. In 1919, the Michigan State Highway Department (MSHD)[a] signposted the highway system for the first time, and three different highways followed sections of the modern I-94 corridor. The original M-11 ran from the Indiana state line north to Coloma where M-17 connected easterly to Detroit. The third highway was M-19 from Detroit northeast to Port Huron. On November 11, 1926, the United States Numbered Highway System was approved by the American Association of State Highway Officials (AASHO),[b] and the original route of US 12[c] replaced the highways from the state line northeasterly to Detroit; US 31 overlapped the highway between St. Joseph and Watervliet. The remainder of the future I-94 corridor was served by US 25 between Detroit and Port Huron. The first span of the Blue Water Bridge opened between Port Huron and Point Edward, Ontario, in 1938. The first segments of upgraded highways along the future route of I-94 were added during World War II. Construction on the Willow Run Expressway started in 1941 before the US entered the war. It was opened on September 12, 1942, to provide improved access to Ford's Willow Run bomber plants. The highway was given the M-112 designation at the time. The expressway was extended eastward as the Detroit Industrial Expressway into Detroit; the first section opened in 1943 and the remainder was completed in March 1945. Land acquisition for the Edsel Ford Freeway started in 1945. Originally referred to as the Crosstown Freeway, the freeway became known as the Edsel Ford Freeway following an April 1946 petition. The interchange between the Lodge Freeway and the Edsel Ford Freeway was built in 1953 as the first full freeway-to-freeway interchange in the United States. In mid-1956, the M-112 designation was decommissioned and replaced by a rerouted US 12. During the mid-1950s, the Detroit Streets and Rails campaign proposed a high-speed rail line in the median of the Willow Run, Detroit Industrial and Edsel Ford freeways; instead of building the rail line, special boarding stations adjacent to dedicated bus lanes in the interchanges along the highway were used. In other parts of the state, other segments of highway were built to bypass the cities along the future I-94 corridor. In 1940, a southern bypass of Battle Creek opened along Columbia Avenue, and the former routing through downtown on Michigan Avenue became Business US 12 (Bus. US 12). In late 1951 or early 1952, a northerly bypass of Jackson opened, and the former route through downtown on Michigan Avenue became another Bus. US 12. By the next year, the western half of the Jackson bypass opened, including a bypass of Parma. In 1954, a new bypass of Kalamazoo and Galesburg opened; US 12 was rerouted to follow the new highway while M-96 replaced part of the old route and US 12A in the area. The first planning maps from 1947 for what later became the Interstate Highway System included a highway along I-94's route in Michigan. This highway was included on the 1955 plan for the "National System of Interstate and Defense Highways" with a proposed spur in the Battle Creek area. The modern I-94 was numbered I-92 between Benton Harbor–St. Joseph and Detroit with I-77 from Detroit to Port Huron in the August 1957 plans. In April 1958, the MSHD wanted to provide a single number for a more direct routing of a Detroit–Chicago freeway; the state proposed rerouting I-94 to replace I-92 in the state, but retained the I-77 designation. On June 27, 1958, AASHO adopted their original numbering plan for Michigan, minus the state's proposed changes. Around the same time, a section of M-146 near Port Huron was converted into an approach freeway for the Blue Water Bridge. In January 1959, officials announced that sections of US 12, the Willow Run, Detroit Industrial and Edsel Ford expressways were to be given the I-94 designation, temporarily co-designated with US 12. 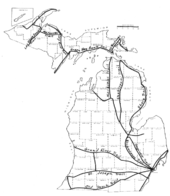 These sections connected Ann Arbor to Detroit, along with a bypass of Kalamazoo to Galesburg and a bypass of Jackson. Later that year, additional segments of I-94 were opened, starting with a 10-mile (16 km) section from Hartford to Coloma, then another from Paw Paw to Kalamazoo which connected with a segment between Galesburg to Battle Creek. The overall 45-mile (72 km) section from Paw Paw to Battle Creek was dedicated on December 7, 1959. In addition, a new northwest–southeast section of freeway was built east of Ypsilanti to create a more gradual curve in the routing between present-day exits 185 and 186, the original routing of the Willow Run Expressway having followed present-day Wiard Road. Signage for the state's Interstate Highways was placed on hold pending finalization of the numbering scheme, and by late 1959 that signage was being added starting with I-75 and followed by the other open segments of freeway in the state. Sections of freeway opened in southwestern Michigan in 1960 between the Benton Harbor–St Joseph area and between Jackson and Ann Arbor; the latter was built over existing portions of US 12. In this year, Michigan became the first state to complete a border-to-border toll-free Interstate within their state, running for 205 miles (330 km) from Detroit toward New Buffalo, creating the longest toll-free freeway in the country at the time. In January 1962, the US 12 designation was removed from the I-94 freeway. In the process, the designation was transferred to replace the US 112 designation in its entirety. After this transfer, I-94 was no longer concurrent with US 12, except for the Ypsilanti bypass. In 1963, the freeway was extended south of New Buffalo to end at M-239. Traffic was diverted down M-239 into Indiana where State Road 39 carried traffic the rest of the way to the Indiana Toll Road. By the end of the year, a section of highway opened between Mount Clemens and Marysville, and US 25 was rerouted to run concurrently along the freeway from the New Baltimore area northward. A landmark along I-94 in Allen Park, the Uniroyal Giant Tire was installed there in 1966. The eastern terminus of I-94 in the Port Huron area was dedicated on October 14, 1964, signaling the completion of the highway between Marysville and the Blue Water Bridge. This completion displaced part of the M-146 bypass of Port Huron, the southern leg of which was retained as a connector to present-day Lapeer Road. Two years later, the gap between the Wayne–Macomb county line and the end of the freeway near Mount Clemens was filled in when another section of freeway opened. In late 1964, a plan was approved to improve the interchange with Telegraph Road (US 24), as the original interchange did not feature access in all directions. North of Albion, the route of the freeway previously crossed a branch of the New York Central Railroad at-grade; the crossing was eliminated when the tracks were removed in 1968. The sections originally designated as the Willow Run Expressway were rebuilt from Rawsonville Road in Belleville to Ozga Road in Romulus starting in 1972. As part of this reconstruction, the segment between Haggerty Road and Ozga Road was widened from four to six lanes, and the eastbound lanes were realigned to facilitate construction of an interchange with I-275, a western bypass of Detroit which was under construction at the time. The Willow Run segment was also resurfaced at this point, as the old road bed did not contain steel mesh. Construction of this interchange also obliterated a partial interchange with Huron River Drive. The final section of I-94 in Michigan opened to traffic on November 2, 1972, when the connection across the state line into Indiana was dedicated. This last segment in Michigan between M-239 and the state line opened when Indiana completed an 18-mile (29 km) segment of freeway in their state. The interchange with the Southfield Freeway (M-39) was closed entirely in 1985 to replace the original exit design, which included four on-ramps that sharply merged into the left lanes of I-94. Reconstruction added new on-ramps that merge into the freeway's right lane, while also moving the carriageways of I-94 closer together. On August 16, 1987, Northwest Airlines Flight 255 crashed after attempting to take off from Detroit Metropolitan Wayne County Airport, killing all but one passenger upon exploding at the I-94 overpass over Middlebelt Road; that overpass was not damaged in the crash. The freeway was closed until August 18, and a memorial was later installed near the interchange between I-94 and Middlebelt Road. The completion of I-69 in the 1980s, and the approval of the North American Free Trade Agreement, increased traffic at the Blue Water Bridge. A new toll and customs plaza was built in 1991, and later the next year, an international task force determined that traffic on the existing structure was exceeding capacity. Environmental planning started in 1993, and construction started on the second span between Port Huron and Point Edward, Ontario in 1995. In July 1997, the second span opened. The original span was closed for rehabilitation, and both were opened to traffic in 1999. The interchange with US 24 (Telegraph Road) following its mid-1960s redesign had only two bridges, and left hand exits were used throughout. This interchange was reconfigured in 2005 to a single-point urban interchange (SPUI) design that was completed in December of that year. A pair of bridges called the Gateway Arch Bridges (alternately "Gateway to Detroit") was incorporated in the new interchange. In 2011, construction was started to widen I-94/I-69 approaching the Blue Water Bridge and to allow for dedicated local traffic and bridge traffic lanes. The lane configuration changes confused drivers in the area, especially motorists with outdated GPS devices; because of this, MDOT installed updated signs complete with American and Canadian flags to help prevent drivers from heading to Canada by mistake. Additional construction in the Port Huron area started in late 2013 to rebuild and reconfigure the I-94/I-69 interchange outside the city. The project improved 3.7 miles (6.0 km) of freeway, replaced several bridges and ramps and cost $76 million (equivalent to $82.4 million in 2018). In June 2014, MDOT closed the ramps from I-69 eastbound to BL I-69 through the interchange until later in the year. The project was completed in September 2015. In 2016, the sections of I-94 from the Indiana state line to the M-63 interchange was designated as part of the West Michigan Pike Pure Michigan Byway. The West Michigan Pike originated in efforts in the 1910s to improve a highway along the western part of the Lower Peninsula of Michigan and to increase tourism along the Lake Michigan shore. The auto trail was eventually superseded by US 12 and US 31 after the creation of the United States Numbered Highway System in 1926. MDOT announced in November 2018 that the stretch from I-96 to Conner Avenue within the Detroit city limits would undergo a complete reconstruction project in the 2020s. This project is slated to include new pavement and lighting, and the replacement of 67 bridges. Sections of I-94 are named for businessman Edsel Ford (left) and Congressman James O'Hara (right). As the original expressway through the center of Detroit was being planned in the 1940s, it was unofficially named the Harper–McGraw Expressway after the streets along which it was to run. There was some initial support to name it after Roy Chapin, the late president of the Hudson Motor Car Company and a former United States Secretary of Commerce under President Herbert Hoover. On April 23, 1946, the Detroit Common Council voted instead to name the highway after Edsel Ford, the son of Henry Ford and president of the Ford Motor Company from 1918 until his death in 1943. Two other original sections of I-94's predecessor highways in the Detroit area were given early names. The westernmost of these is the Willow Run Expressway, named for the Willow Run complex. The plants at Willow Run produced B-24 Liberator bombers for Ford Motor Company during World War II. The second, the Detroit Industrial Expressway, continued the route of the Willow Run Expressway eastward into Detroit. Both highways were built to move workers from Detroit to the industrial plants at Willow Run during the war and were later incorporated into I-94 in the 1950s as part of a Detroit–Chicago highway. The section of I-94 northeast of Detroit was named after former Congressman James G. O'Hara by the Michigan Legislature. O'Hara was a World War II veteran who served in the United States House from 1959 until 1977. During his tenure in Congress, he procured federal funds for the construction of I-94 through his district. The first attempt to name the highway after him failed in 1991, but the honor was included in a budget bill passed in 1997. The section of I-94 was dedicated on October 16, 1998, after donors privately raised nearly $10,000 (equivalent to $14,664 in 2018) to pay for the highway signs. A segment of I-94 in Battle Creek between the exits for Business Loop I-94 (BL I-94) and I-194 was named the 94th Combat Infantry Division Memorial Highway by the Michigan Legislature in 2002. The name honors the US Army's 94th Infantry Division, which was activated at the nearby Fort Custer in 1942 and served with distinction in the European theatre of World War II. Because the unit originated in Battle Creek, and its number matched that of the freeway, the Legislature added the designation by passing Public Act 305 of 2002. The name was dedicated in ceremonies at a rest stop along the section of I-94 on September 28, 2002. Another piece of I-94 in Calhoun County was designated in 2004 as part of the Underground Railroad Memorial Highway. [d] Starting in 1990, the National Park Service started working to identify routes of the Underground Railroad. The Battle Creek area was active in the railroad during the Civil War, and the section of I-94 between exits 98 and 110 east of Battle Creek was included in the memorial designation. In June 2012, after a resolution passed by the Michigan Legislature was signed by Gov. Rick Snyder, a portion of I-94 in Taylor between Inkster and Pelham roads was named the "Auxiliary Lt. Dan Kromer Memorial Highway" after a 20-year veteran of the Taylor Police Department, who was killed in 2010 while helping motorists who had car trouble. Signage along I-194/M-66, the "Sojourner Truth Downtown Parkway"
There are nine highways related to I-94 in Michigan. The first is the spur into downtown Battle Creek numbered I-194 and nicknamed "The Penetrator" and officially called the "Sojourner Truth Downtown Parkway". This auxiliary Interstate Highway runs for about three miles (4.8 km) to connect I-94 northward into downtown. The other eight highways are business loops of I-94 that connect various cities' downtowns with the main freeway. Unlike I-194, these loops are not freeways. Located from west to east along I-94's routing in Michigan, they serve Benton Harbor–St. Joseph, Kalamazoo, Battle Creek, Marshall, Albion, Jackson, Ann Arbor, and Port Huron. ^ At the time the United States Numbered Highway System was created, the highway along the modern US 12 through Coldwater and Ypsilanti to Detroit was numbered US 112. ^ The other highway so designated is a section of US 131. ^ a b Treloar, James (December 2, 1959). "Expressway Will Remake Southwest Michigan: 55 Miles More Open Next Week". The News-Palladium. Benton Harbor, MI. § 2, p. 1. OCLC 10117334. Retrieved August 14, 2016 – via Newspapers.com. ^ a b c Michigan Department of Transportation & Michigan Center for Shared Solutions and Technology Partnerships (2009). MDOT Physical Reference Finder Application (Map). Michigan Department of Transportation. Retrieved August 7, 2013. ^ Natzke, Stefan; Neathery, Mike & Adderly, Kevin (June 20, 2012). "What is the National Highway System?". National Highway System. Federal Highway Administration. Archived from the original on September 21, 2012. Retrieved July 1, 2012. ^ Bureau of Transportation Planning (2015). "Traffic Monitoring Information System". Michigan Department of Transportation. Retrieved December 14, 2016. ^ a b c d e f g h i j k l m n o Michigan Department of Transportation (2013). Pure Michigan: State Transportation Map (Map). c. 1:975,000. Lansing: Michigan Department of Transportation. §§ N7–M14, M14–K14. OCLC 42778335, 861227559. ^ a b c d e f g h i j k l m n Google (August 20, 2013). "Overview Map of Interstate 94 in Michigan" (Map). Google Maps. Google. Retrieved August 20, 2013. ^ Barnett, LeRoy (2004). A Drive Down Memory Lane: The Named State and Federal Highways of Michigan. Allegan Forest, MI: The Priscilla Press. p. 183. ISBN 1-886167-24-9. OCLC 57425393. ^ a b Michigan Department of Transportation (n.d.). "Road & Highway Facts". History & Culture. Michigan Department of Transportation. Archived from the original on August 2, 2013. Retrieved August 20, 2013. ^ Strong, Michael (October 24, 2005). "Detroit Builds Gateway Link Inspired by Super Bowl". Engineering News-Record. Archived from the original on February 5, 2012. Retrieved August 20, 2013. ^ Michigan Legislature (1915) [enacted May 13, 1913]. "Chapter 91: State Reward Trunk Line Highways". In Shields, Edmund C.; Black, Cyrenius P. & Broomfield, Archibald (eds.). The Compiled Laws of the State of Michigan. Vol. 1. Lansing, MI: Wynkoop, Hallenbeck, Crawford. pp. 1868–72. OCLC 44724558. Retrieved January 24, 2012 – via Google Books. ^ McNichol, Dan (2006). The Roads that Built America: The Incredible Story of the US Interstate System. New York: Sterling. p. 74. ISBN 1-4027-3468-9. OCLC 63377558. ^ Federal Highway Administration (December 4, 2012). "November 13". Highway History. Federal Highway Administration. Archived from the original on September 27, 2013. Retrieved August 18, 2013. ^ Hyde, Charles K. (1993). Historic Highway Bridges of Michigan. Great Lakes Books. Detroit: Wayne State University Press. p. 109. ISBN 0-8143-2448-7. OCLC 27011079. ^ a b Michigan State Highway Department (April 15, 1956). Official Highway Map (Map). [c. 1:918,720]. Lansing: Michigan State Highway Department. §§ M12–M13. OCLC 12701120. ^ a b Michigan State Highway Department (October 1, 1956). Official Highway Map (Map). [c. 1:918,720]. Lansing: Michigan State Highway Department. §§ M12–M13. OCLC 12701120. Retrieved May 21, 2017 – via Archives of Michigan. ^ a b c d "Aging Willow Run Expressway Has Served Michigan Well". The Ann Arbor News. July 15, 1972. p. 12. OCLC 9497417. Archived from the original on January 16, 2014. Retrieved August 21, 2013 – via Ann Arbor District Library. ^ Michigan State Highway Department & Rand McNally (June 1, 1943). Official Michigan Highway Map (Map) (Summer ed.). [c. 1:850,000]. Lansing: Michigan State Highway Department. §§ M12–M13. ^ Michigan Department of Transportation (n.d.). "US 12 (Michigan Avenue)–I-94". Michigan's Historic Bridges. Michigan Department of Transportation. Archived from the original on October 19, 2012. Retrieved August 20, 2013. ^ Naber, MaryAnn (November 1, 2006). "Final List of Nationally and Exceptionally Significant Features of the Federal Interstate Highway System". Historic Preservation: Interstate Highway System. Federal Highway Administration. Archived from the original on August 11, 2006. Retrieved July 6, 2006. ^ Michigan Department of Transportation (n.d.). "I-94 EB / I-94 Ramp to M-10". Michigan Department of Transportation. Archived from the original on September 7, 2015. Retrieved August 20, 2016. ^ Brown, Bernice (n.d.). "Edsel Ford Expressway". Encyclopedia of Detroit. Detroit Historical Society. Archived from the original on November 1, 2013. Retrieved August 21, 2013. ^ Public Roads Administration (August 2, 1947). National System of Interstate Highways (Map). Scale not given. Washington, DC: Public Roads Administration. Retrieved September 4, 2010 – via Wikimedia Commons. ^ Public Roads Administration (September 1955). "National System of Interstate and Defense Highways" (Map). General Location of National System of Interstate Highways Including All Additional Routes at Urban Areas Designated in September 1955. Scale not given. Washington, DC: US Government Printing Office. OCLC 416597 – via Wikimedia Commons. ^ Public Roads Administration (August 2, 1947). National System of Interstate Highways (Map). Scale not given. Washington, DC: Public Roads Administration. Archived from the original on October 23, 2010. Retrieved May 10, 2008. ^ Michigan State Highway Department (April 25, 1958). "Recommended Numbering: Interstate Highways in Michigan". Lansing: Michigan State Highway Department. Archived from the original on November 21, 2003. Retrieved May 10, 2008. ^ American Association of State Highway Officials (June 27, 1958). Official Route Numbering for the National System of Interstate and Defense Highways (Map). Scale not given. Washington, DC: American Association of State Highway Officials. Retrieved May 10, 2008 – via Wikimedia Commons. ^ "Temporary Double Signs for Highway". The News-Palladium. Benton Harbor, MI. January 15, 1959. § 2, p. 1. OCLC 10117334. Retrieved July 13, 2018 – via Newspapers.com. ^ Michigan Department of Transportation (n.d.). "1960s". History & Culture. Michigan Department of Transportation. Archived from the original on December 22, 2012. Retrieved August 20, 2013. ^ "Highway System Discussed for Lions Tuesday". Escanaba Daily Press. January 19, 1961. p. 15. OCLC 9670912. Retrieved May 3, 2015 – via Newspapers.com. ^ "Area Road Signs To Be Changed". The News-Palladium. Benton Harbor, MI. Associated Press. January 9, 1962. § 2, p. 5. OCLC 10117334. Retrieved July 13, 2018 – via Newspapers.com. ^ Michigan State Highway Department (1962). Official Highway Map (Map). [c. 1:918,720]. Lansing: Michigan State Highway Department. §§ N7–M13. OCLC 12701120, 173191490. Retrieved June 17, 2017 – via Archives of Michigan. ^ "South of New Buffalo: I-94 Section Opens Tomorrow". The News-Palladium. Benton Harbor, MI. August 14, 1963. § 2 p. 1. OCLC 10117334. Retrieved May 3, 2015 – via Newspapers.com. ^ Michigan State Highway Department (1963). Official Highway Map (Map). [c. 1:918,720]. Lansing: Michigan State Highway Department. §§ L14–M14. OCLC 12701120. Retrieved August 12, 2017 – via Archives of Michigan. ^ Michigan State Highway Department (1964). Official Highway Map (Map). [c. 1:918,720]. Lansing: Michigan State Highway Department. §§ L14–M14. OCLC 12701120, 81213707. ^ Baulch, Vivian M. & Zacharias, Patricia (February 26, 1997). "Detroit's Giant Stove and Tire". The Detroit News. Archived from the original on March 6, 2009. Retrieved May 7, 2016. ^ "I-94 Terminus Is Dedicated". The Holland Evening Sentinel. United Press International. October 14, 1964. p. 12. ISSN 1050-4044. OCLC 13440201. Retrieved May 3, 2015 – via Newspapers.com. ^ Michigan Department of State Highways (1966). Official Highway Map (Map). [c. 1:918,720]. Lansing: Michigan Department of State Highways. § M14. OCLC 12701120. Retrieved August 2, 2017 – via Archives of Michigan. ^ Michigan Department of State Highways (1967). Michigan Water-Winter Wonderland: Official Highway Map (Map). [c. 1:918,720]. Lansing: Michigan Department of State Highways. § M14. OCLC 12701120. ^ "Dearborn I-94 Plan Approved". Detroit Free Press. September 25, 1964. p. 5A. Retrieved July 10, 2018 – via Newspapers.com. ^ "Railroad Once Crossed I-94". Albion Morning Star. July 27, 2008. p. 6. Archived from the original on August 11, 2014. Retrieved August 9, 2014 – via Albion Historical Notebook. ^ Michigan Department of State Highways (1973). Michigan, Great Lake State: Official Highway Map (Map). c. 1:158,400. Lansing: Michigan Department of State Highways. Detroit and Vicinity inset. § G5. OCLC 12701120, 81679137. ^ Michigan Department of State Highways and Transportation (1974). Michigan, Great Lake State: Official Transportation Map (Map). c. 1:158,400. Lansing: Michigan Department of State Highways and Transportation. Detroit and Vicinity inset. § G5. OCLC 12701177, 83138602. Retrieved October 20, 2017 – via Archives of Michigan. ^ "Last Stretch of I-94 Open". Ironwood Daily Globe. Associated Press. November 2, 1972. p. 7. OCLC 10890811. Retrieved May 3, 2015 – via Newspapers.com. ^ Laitner, Bill (April 1, 1985). "DOT Promises Road Construction Will Be Hassle-Free". Detroit Free Press. p. 3E. Retrieved July 10, 2018 – via Newspapers.com. ^ "Horror, Grief and Debris Mark Scene of Fatal Crash". The San Bernardino County Sun. San Bernardino, CA. Associated Press. August 18, 1987. p. A5. OCLC 51620589. Retrieved May 3, 2015 – via Newspapers.com. ^ Burnett, Jim; Kolstad, James L.; Lauber, John L. & Nall, Joseph T. (May 10, 1988). Aircraft Accident Report: Northwest Airlines, Inc., McDonnell-Douglas DC-9-82, N312RC, Detroit Metropolitan Wayne County Airport, Romulus, Michigan, August 16, 1987 (PDF). Washington, DC: National Transportation Safety Board. p. 5. NTSB/AAR-88/05. Archived (PDF) from the original on January 14, 2017. Retrieved January 7, 2017. ^ "Memorial Held for Victims of 1987 Plane Crash". MLive.com. Booth Newspapers. Associated Press. August 16, 2012. Archived from the original on September 18, 2018. Retrieved January 7, 2017. ^ Hyde (1993), p. 152. ^ a b Blue Water Bridge (n.d.). "Construction of the Second Span". Research Library. Blue Water Bridge. Archived from the original on March 22, 2016. Retrieved January 7, 2017. ^ Egan, Paul (July 23, 1997). "Just Another Day for Cars, Trucks as New Blue Water Bridge Opens". Times Herald. Port Huron, MI. p. 1A. OCLC 36177739. Retrieved August 26, 2018 – via Newspapers.com. ^ American Automobile Association (October 1971). AAA Detroit Southern Suburbs (Map). Scale not given. Falls Church, VA: American Automobile Association. Telegraph Road Interchange inset. Archived from the original on June 3, 2014. ^ Michigan Department of Transportation (n.d.). "Single-Point Urban Interchange (SPUI)". Michigan Department of Transportation. Archived from the original on September 29, 2007. Retrieved June 2, 2014. ^ McGraw, Bill (September 28, 2005). "I-94 Bridge Builders Go by the Playbook". Detroit Free Press. pp. 1B, 2B. ISSN 1055-2758. ^ Abdalla, Hiba & Benesch, Alfred (February 28, 2014). "Case Study: Designing Michigan's I-94 Gateway Arch Bridges". LUSAS Bridge. Archived from the original on February 21, 2014. Retrieved June 2, 2014. ^ Helms, Matt (February 17, 2011). "$90M Upgrade Coming to I-94/I-69 in Port Huron Area". Detroit Free Press. Archived from the original on January 4, 2014. Retrieved August 19, 2013. ^ Morosi, Rob (n.d.). "Seeing Is Believing on I-94". Michigan Department of Transportation. Archived from the original on December 3, 2016. Retrieved August 21, 2013. ^ LeBlanc, Beth (June 3, 2013). "New MDOT Freeway Fix Shakes up Neighbors: Rumble Strips to Alert Drivers Irritate Families". Times Herald. Port Huron, MI. Archived from the original on August 19, 2013. Retrieved August 19, 2013. ^ a b Thomas, Ryland & Williamson, Samuel H. (2019). "What Was the U.S. GDP Then?". MeasuringWorth. Retrieved April 6, 2019. United States Gross Domestic Product deflator figures follow the Measuring Worth series. ^ LeBlanc, Beth (June 26, 2014). "Construction Will Close Eastbound I-69 Exit". Times Herald. Port Huron, MI. Archived from the original on July 14, 2014. Retrieved July 13, 2014. ^ Greenwood, Tom (September 16, 2015). "MDOT Reopens I-94/I-69 Interchange near Port Huron". The Detroit News. Archived from the original on September 27, 2016. Retrieved September 24, 2016. ^ Witt, Jeremy (July 22, 2016). "State's Newest Michigan Byway to Be Designated on Monday". West Michigan Tourist Association. Archived from the original on October 11, 2016. Retrieved July 23, 2016. ^ Barnett (2004), p. 237. ^ DeGiulio, Kim & Hutchinson, Derick (November 27, 2018). "MDOT: 7-Mile Stretch of I-94, 67 Bridges Set for Major Overhaul in Metro Detroit". ClickOnDetroit. Detroit: WDIV-TV. Archived from the original on November 28, 2018. Retrieved January 27, 2019. ^ Barnett (2004), p. 81. ^ Barnett (2004), pp. 240–41. ^ Barnett (2004), pp. 67–68. ^ Barnett (2004), p. 117. ^ Barnett (2004), pp. 163–4. ^ a b Barnett (2004), pp. 215–16. ^ Office of the Governor (June 29, 2012). "Snyder Signs Bills to Commit Dollars to Infrastructure" (Press release). Office of the Governor. Archived from the original on March 4, 2016. Retrieved August 31, 2012. ^ "I-94 Interchange Closes Monday". Battle Creek Enquirer. April 24, 2009. OCLC 33956507. ^ a b Michigan State Highway Department (1962). Official Highway Map (Map). Scale not given. Lansing: Michigan State Highway Department. Jackson inset. OCLC 12701120, 173191490. Retrieved June 17, 2017 – via Archives of Michigan. ^ a b Michigan State Highway Department (1963). Official Highway Map (Map). Scale not given. Lansing: Michigan State Highway Department. Jackson inset. OCLC 12701120. Retrieved August 12, 2017 – via Archives of Michigan. ^ Michigan Department of Transportation (n.d.). "I-94, Sargent Road Interchange Reconstruction" (PDF). Michigan Department of Transportation. Archived from the original (PDF) on June 16, 2012. Retrieved October 26, 2012. ^ Arend, Kari (October 21, 2012). "Continuous Single-Lane Closure on I-94 at Sargent Road in Jackson to Start Oct. 21" (Press release). Michigan Department of Transportation. Archived from the original on October 20, 2012. Retrieved October 26, 2012. ^ Michigan State Highway Department (1962). Official Highway Map (Map). [c. 1:918,720]. Lansing: Michigan State Highway Department. § M12. OCLC 12701120, 173191490. Retrieved June 17, 2017 – via Archives of Michigan. ^ Michigan State Highway Department (1963). Official Highway Map (Map). [c. 1:918,720]. Lansing: Michigan State Highway Department. § M12. OCLC 12701120. Retrieved August 12, 2017 – via Archives of Michigan. ^ Michigan Department of State Highways (1967). Michigan Water-Winter Wonderland: Official Highway Map (Map). Not to scale. Lansing: Michigan Department of State Highways. Michigan Freeways inset. OCLC 12701120. ^ Michigan Department of State Highways (1968). Official Highway Map (Map). c. 1:158,400. Lansing: Michigan Department of State Highways. Detroit and Vicinity inset. OCLC 12701120. Retrieved August 12, 2017 – via Archives of Michigan. ^ Michigan Department of State Highways (1973). Michigan, Great Lake State: Official Highway Map (Map). c. 1:158,400. Lansing: Michigan Department of State Highways. Detroit and Vicinity inset. OCLC 12701120, 81679137. ^ Michigan Department of State Highways and Transportation (1974). Michigan, Great Lake State: Official Transportation Map (Map). c. 1:158,400. Lansing: Michigan Department of State Highways and Transportation. Detroit and Vicinity inset. OCLC 12701177, 83138602. Retrieved October 20, 2017 – via Archives of Michigan. ^ Morosi, Rob (January 7, 2012). "Preliminary Work Begins This Week on West Grand Boulevard Overpass above I-94 in Detroit" (Press release). Michigan Department of Transportation. Archived from the original on February 22, 2015. Retrieved February 21, 2015. Wikimedia Commons has media related to Interstate 94 in Michigan. This page was last edited on 18 April 2019, at 00:02 (UTC).